As you know, biscuits are serious. I’ve detailed before the foundational recipe for buttermilk biscuits. However, as a biscuit artist, I am always experimenting. Recently I made the most delicious biscuits I’ve ever–EVER–eaten. Put self-rising flour in a bowl. The amount will vary based on the number of biscuits you want, but maybe start with three cups. Add Crisco shortening with your hands until it starts to bead. Add a half a stick of butter. Add a half of a cup of Miracle Whip. 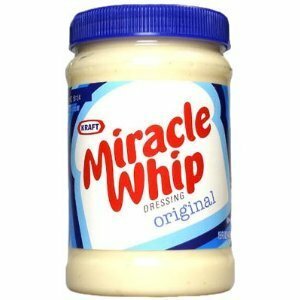 Mayo would work too, but I prefer Miracle Whip. Mix the dough well, then add the buttermilk in small doses until the dough forms one large ball and is sticky. Sprinkle a little regular flour down on the counter top (or a roll pad) and then turn the dough over a couple of times until it is no longer sticky. Cut into biscuits using an empty, clean, tuna can. Now, let’s change up my usual a little bit more. Dab buttermilk on top of the biscuits. If you have time, let the uncooked biscuits sit for an hour. Put the biscuits into the pan–squeezing them together if necessary. Bake for 20-21 minutes. Ovens may vary. I found this batch to be fantastic. Give it a try. The key to making great biscuits is to experiment. I found that the butter made them moister and the Miracle Whip gave them outstanding flavor.